Louisville Forklift Training and Certification, Get Certified Today! CertifyMe.net, the online leader in forklift certification in Louisville, KY, offers a full slate of training courses for all types of forklift drivers. Many area employers rely on us for their forklift certification in Louisville. With Louisville’s strategic location along the Ohio River, and given the city’s place as a transportation and economic hub for Kentucky and beyond, you’ll need to train all of your forklift operators, if they don’t have U.S. Occupational Safety and Health Administration (OSHA) compliance. Let CertifyMe.net handle your Louisville forklift certification. It’s easy to sign up. We offer lifetime support and recertification training. What’s more, our affordable prices ensure your company’s training costs will always stay within your budget. Don’t wait with your forklift certification in Louisville. If you have anyone operating a forklift without the proper training, it’s a violation of federal law, not to mention OSHA regulations. See how our Louisville forklift certification program can benefit your company today – get started with our OSHA compliant forklift certification in Louisville! Forklifts are highly specialized and potentially dangerous pieces of equipment. There are strict guidelines laid out by the OSHA about how they need to be handled. Before you can consider applying for a job as a forklift operator, you’ll need to make sure you know what you’re doing. Employers will offer more training on site – in fact, they’re required to by law – but they’ll need to know that you’re familiar with the equipment before getting started. Fortunately, it’s quick, easy, and cost-effective to take an online course that’s recognized state-wide. From short videos and simple-to-follow instructions, you’ll learn the ins and outs of safely operating a forklift according to OSHA guidelines. Remember: you’ll be responsible for the safety of the crew you’ll be working with as well as your own safety, and the property you’re handling will need to remain undamaged. With this training you’ll learn everything you need to know to be confident going in. All employers need proof that their forklift operators are fully qualified to operate powered industrial trucks. Forklift certification in Louisville gives them the assurance they need that you’re up to code, even before they give you the site-specific training that will complete the process. It’s in everyone’s best interest to have a firm footing when beginning the hiring process. Louisville forklift certification gives you and your employees the confidence to start a long and fruitful working relationship. This is true for forklift training in Louisville, KY, and all over the United states. Who’s Hiring Forklift Operators in Louisville? Gordon Food Service is a respected business in the Louisville community that safely manages the storage and distribution of food to their customers, and they need qualified tradespeople to accomplish their mission. Consider their warehousing division that’s currently looking to hire forklift operators. If you have your forklift training in Louisville, KY, you’ll give yourself the best chance to land a well-paying job at Gordon Food Service. Internationally recognized supply chain firm CEVA Logistics has its fingers in many pies, with locations throughout North America. Their Louisville location is seeking serious candidates to become forklift operators; apply through their local branch. From distribution centers to smaller warehouses, CEVA Logistics offers a wide range of work environments for operators who have their forklift training in Louisville, KY.
We offer six different forklift training courses for operators based in Louisville, KY, along with a Qualified Trainer / Evaluator Certification class, too. 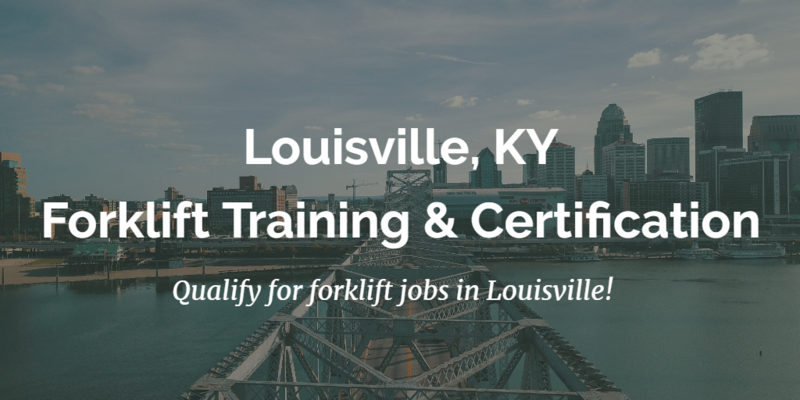 With all the different jobs available in Louisville for OSHA certified forklift drivers, it pays to get the best training possible – but it doesn’t have to be expensive! With our value-added forklift training classes in Louisville, KY, any operator can get the training they need – and become OSHA certified – in no time at all! Sign up today, or give our Louisville forklift training consultants a call at 1-888-699-4800. Thanks for visiting CertifyMe.net!